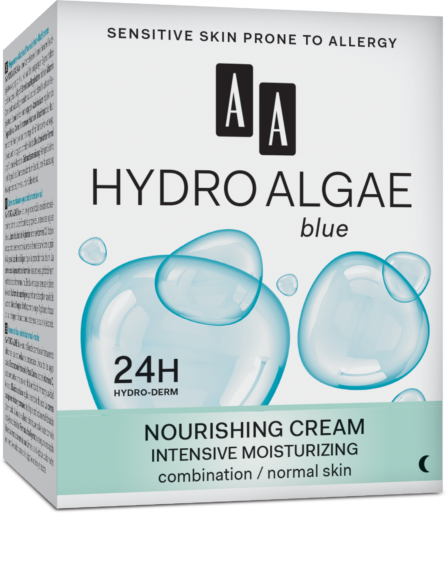 AA HYDRO ALGAE Blue is a line of intensively moisturizing cosmetics formulated with the unique properties of blue algae, which come from deep, clean ocean waters and have naturally turquoise and azure colors. AA HYDRO ALGAE Blue cosmetics provide protection against signs of early skin aging by stimulating natural photoprotection processes. 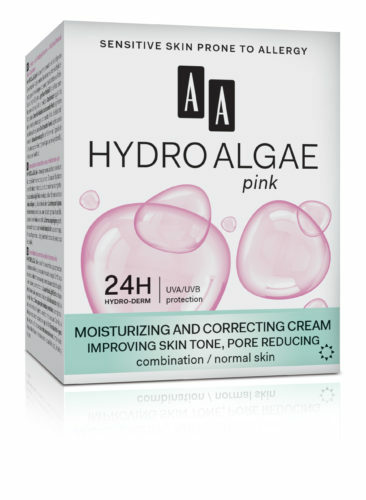 Combined with the two-stage 24-hour Hydro-Derm System, AA HYDRO ALGAE Blue cosmetics provide intensive, long-lasting hydration.Cream for normal and combination complexions gives the skin optimum hydration and a perfect mattifying effect, leaving the skin feeling soft, silky smooth and full of vitality. The super-light formula guarantees quick absorption, while the beautiful fragrance creates a feeling of freshness and energy. Blue algae – stimulate skin regeneration and natural photoprotection processes against external factors and support Vitamin C stabilization, leaving the skin looking brighter. Extract of rose hip fruit is a rich source of leaving the skin looking lighter. Vitamin C, which has anti-oxidant properties, prevents the skin from losing firmness and gives it extra smoothness. Azelaic acid – regulates the secretion of sebum and gives a long-lasting mattifying effect to the skin. Hydrocell Protect System – provides cell cohesion to the epidermis, prevents moisture loss, and increases protection against irritations. Apply every evening onto the cleansed skin of face (avoiding the eye area), neck and décolleté. Aqua, Glycerin, Pentylene Glycol, Tridecyl Salicylate, Glyceryl Stearate, Betaine, Cetearyl Alcohol, Propylene Glycol, Glyceryl Stearate Citrate, Octocrylene, Dicaprylyl Ether, Hydrogenated Polydecene, Nylon-12, Azelaic Acid, Butyl Methoxydibenzoylmethane, Aluminum Starch Octenylsuccinate, Sodium Lactate, Rosa Multiflora Extract, Ceramide NP, Fructose, Arginine, Urea, Hydrolyzed Algae Extract, Maltose, Panthenol, Maris Aqua, Alpha-Glucan Oligosaccharide, Allantoin, Sodium PCA, Trehalose, Sodium Hyaluronate, Glucose, Glyceryl Behenate, Hydrogenated Palm Oil, Borago Officinalis Seed Oil, Squalane, Cholesterol, Citric Acid, Sodium Chloride, Sodium Hydroxide, Trisodium Citrate Dihydrate, Butylene Glycol, Ammonium Acryloyldimethyltaurate/VP Copolymer, Phenoxyethanol, Ethylhexylglycerin, Synthetic Fluorphlogopite, Parfum, CI 42090, CI 77891. All of our cosmetics are 100% tested by people with sensitive and allergy-prone skin. our products contain certified ingredients with no allergenic substances. We use the latest technologies and achievements in the field of cosmetology and dermatology. Enjoy beautiful, well cared-for skin with AA cosmetics!